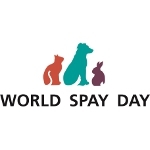 World Spay Day is an annual event dedicated to raising awareness of the spaying (for females) and neutering (for males) as a humane and effective way to save animals' lives. It is observed on the last Tuesday in February. The event was first launched by the Doris Day Animal League in 1995. It was originally known as Spay Day USA. The event focused on promoting spays and neuters to help eliminate the problem of homeless animals. In 2006, the Doris Day Animal League merged with the Human Society of the United States. The Society continues to hold the event as World Spay Day in cooperation with the Humane Society Veterinary Medicine Association and Humane Society International. World Spay Day is the only international day of action to promote the neutering or spaying of pets, street dogs and community cats to save the lives of animals. Spay/neuter is a humane way to control animal population in contrast to shooting and poisoning. How to participate in World Spay Day? Firstly, you can spay your pet if you have one and you haven't spayed it yet. Secondly, you can spread the word via social media and/or informational events. Thirdly, you can help organize a spay/neuter event at a local veterinary clinic or animal shelter or host a fundraising event.